IN-Resourcing™ provides the best advantages of outsourcing plus gives you even more where outsourcing falls short! What you are being offered is completely different to what has been available until now – a totally unique solution to your staffing and workload problems. 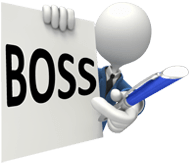 BOSS Pty Ltd (Back Office Shared Services) has taken the best of outsourcing and enhanced where outsourcing fails, into what’s called IN-resourcing™! A model that is very unique from an outsourcing model. With IN-resourcing™, you have complete control over the BOSS accountant and the work they provide, as the accountant is solely employed by your company (as compared with outsourcing, where you give up your control of the accounting process to a service provider). The restructured outsourcing model into In-resourcing™ thoroughly addresses marketplace concerns about control and security of data, and at the same time providing high caliber CA qualified accountants at a salary that suits the BOSS accountants ensuring much higher retention rates and high caliber accountants, but at the same time offering you the cheapest prices on the market today! You maintain complete control as if they were your staff in the next room!